Beliefs and their social (people), environmental (around us), Financial (money) impact. Creation, perfect, stewardship, life after death. Acid rain. Pollution of rivers and lakes. Pollution of seas. 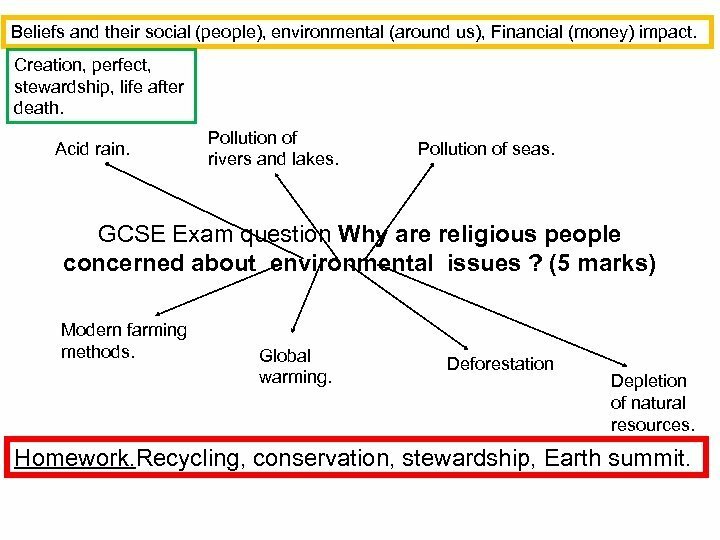 GCSE Exam question Why are religious people concerned about environmental issues ? (5 marks) Modern farming methods. Global warming. Deforestation Depletion of natural resources. Homework. Recycling, conservation, stewardship, Earth summit. 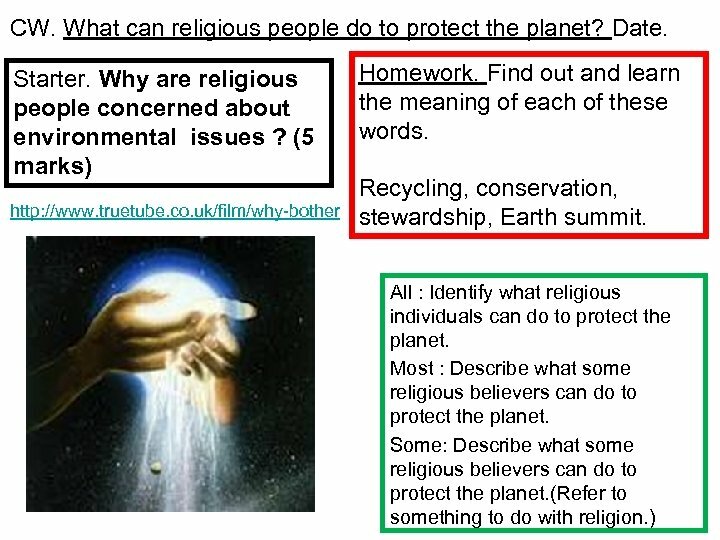 Why are religious people concerned about environmental issues ? (5 marks) Level 1 Something relevant or worthy of credit. Level 2 Elementary knowledge and (destruction of natural understanding, e. g. two simple points. habitat, extinction of species, • two simple points animals + plants, impacts • one point with slight development. upon local climate/quality of Level 3 Sound knowledge and understanding. Includes religion. This could be: life, erosion of soil, impact upon agriculture way of life, • three or more simple points • two points with slight development of one livelihood, severe weather, • one well developed point poverty, loss of life, food Level 4 A clear knowledge and understanding shortages, impact upon future with some development and / or analysis This could include a single point that is generations fewer/ no resources, prevents research exceptionally well-developed. 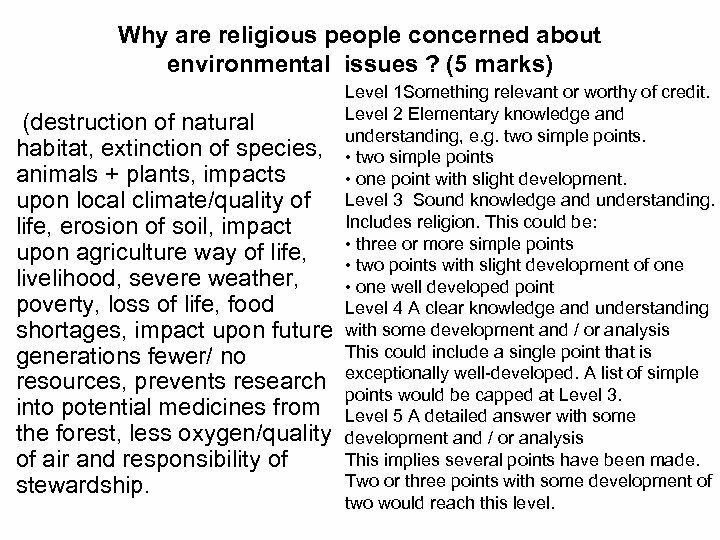 A list of simple points would be capped at Level 3. into potential medicines from Level 5 A detailed answer with some the forest, less oxygen/quality development and / or analysis This implies several points have been made. of air and responsibility of Two or three points with some development of stewardship. two would reach this level. 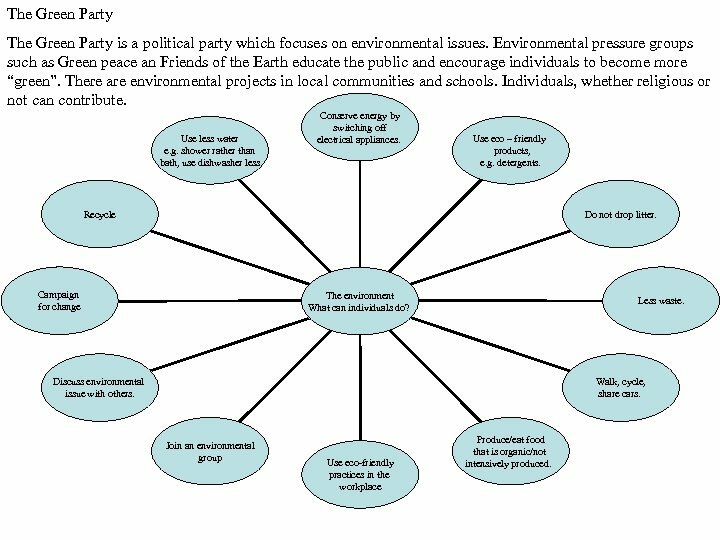 The Green Party is a political party which focuses on environmental issues. 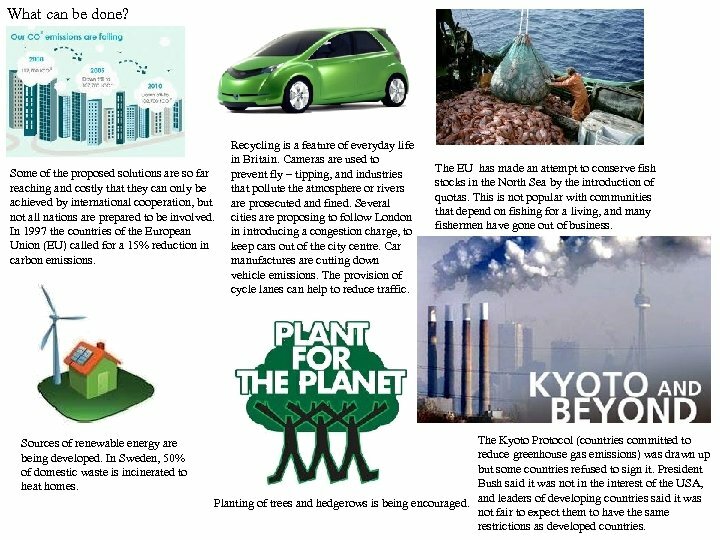 Environmental pressure groups such as Green peace an Friends of the Earth educate the public and encourage individuals to become more “green”. There are environmental projects in local communities and schools. Individuals, whether religious or not can contribute. Use less water e. g. shower rather than bath, use dishwasher less Conserve energy by switching off electrical appliances. Use eco – friendly products, e. g. detergents. Recycle Do not drop litter. Campaign for change The environment What can individuals do? Less waste. Discuss environmental issue with others. Walk, cycle, share cars. Join an environmental group Use eco-friendly practices in the workplace Produce/eat food that is organic/not intensively produced. CW. What can religious people do to protect the planet? Date. Starter. What can be done? Some of the proposed solutions are so far reaching and costly that they can only be achieved by international cooperation, but not all nations are prepared to be involved. In 1997 the countries of the European Union (EU) called for a 15% reduction in carbon emissions. Sources of renewable energy are being developed. In Sweden, 50% of domestic waste is incinerated to heat homes. Recycling is a feature of everyday life in Britain. Cameras are used to prevent fly – tipping, and industries that pollute the atmosphere or rivers are prosecuted and fined. Several cities are proposing to follow London in introducing a congestion charge, to keep cars out of the city centre. Car manufactures are cutting down vehicle emissions. The provision of cycle lanes can help to reduce traffic. The EU has made an attempt to conserve fish stocks in the North Sea by the introduction of quotas. This is not popular with communities that depend on fishing for a living, and many fishermen have gone out of business. The Kyoto Protocol (countries committed to reduce greenhouse gas emissions) was drawn up but some countries refused to sign it. President Bush said it was not in the interest of the USA, Planting of trees and hedgerows is being encouraged. and leaders of developing countries said it was not fair to expect them to have the same restrictions as developed countries. 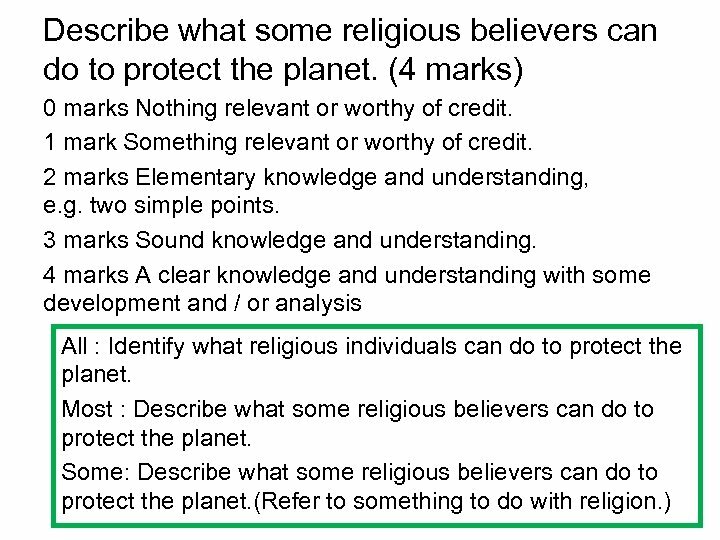 Describe what some religious believers can do to protect the planet. Identify some ideas mentioned in these videos. • http: //www. truetube. co. uk/film/why-bother • http: //www. truetube. co. uk/film/hollys-tips-easy-ways-save -planet • http: //www. truetube. 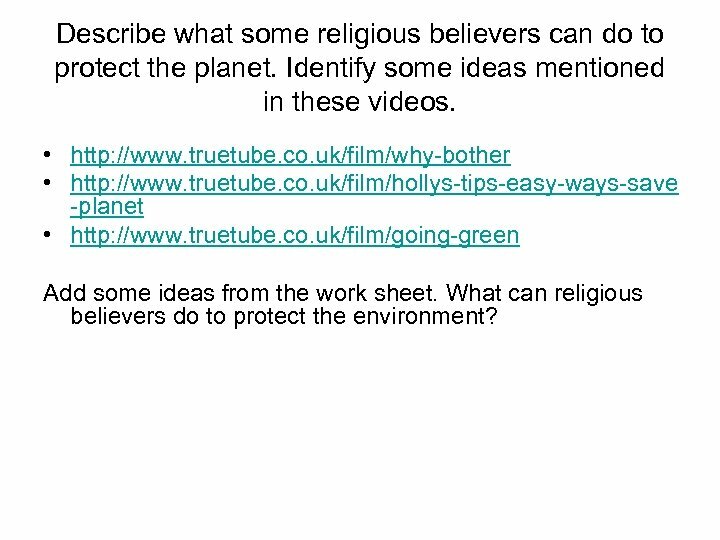 co. uk/film/going-green Add some ideas from the work sheet. 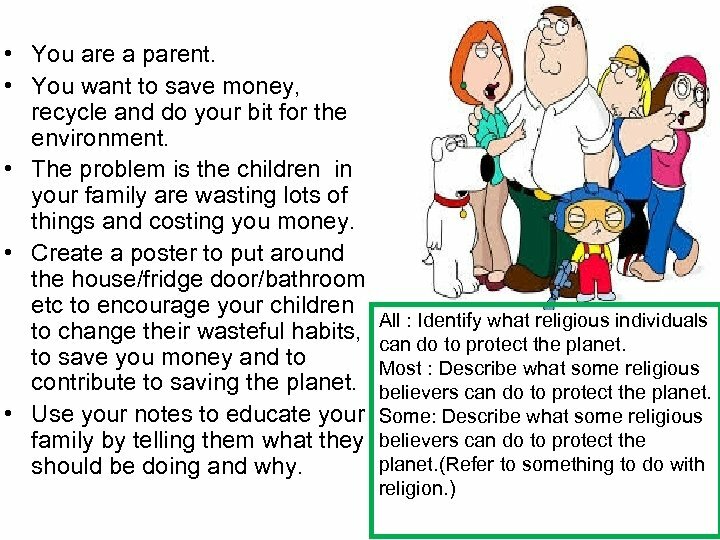 What can religious believers do to protect the environment? 1. 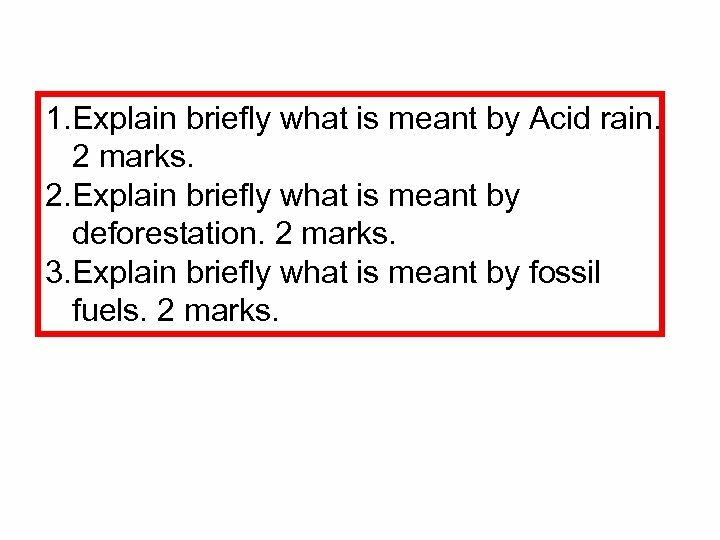 Explain briefly what is meant by Acid rain. 2 marks. 2. Explain briefly what is meant by deforestation. 2 marks. 3. Explain briefly what is meant by fossil fuels. 2 marks.